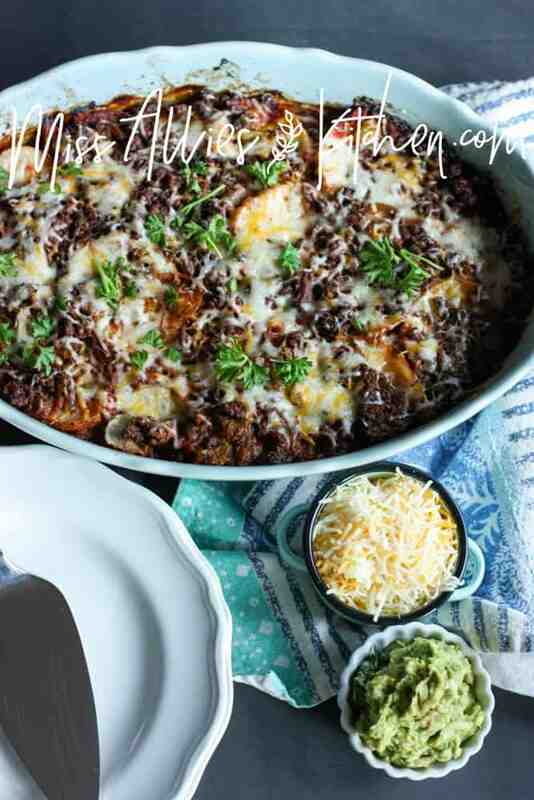 This Tex-Mex Lasagna is a Southwestern spin on a family favorite, with a healthy twist! Hi, again friends! I’m Allie with Miss Allie’s Kitchen, and I’m so glad to be sharing on The Melrose Family; it’s exciting to be here! Today I want to talk about mash-ups. Is there anything truly better than a great mash-up? Combining two flavors, components and ideas and helping them marry so well, you wonder how the two could have existed singularly in the first place? No, we’re not talking about Beyonce and Jay-Z, we’re talking easy, peasy and flavorful dinner solutions. I’m all about creating healthful and flavorful meals; you shouldn’t have to make compromises to nourish your family. 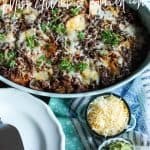 In fact, if you need even more ideas check out this recipe for Pork Carnitas Crock Pot Tacos or my favorite Slow Cooker Braised Short Ribs. Anyway, back to Lasagna. 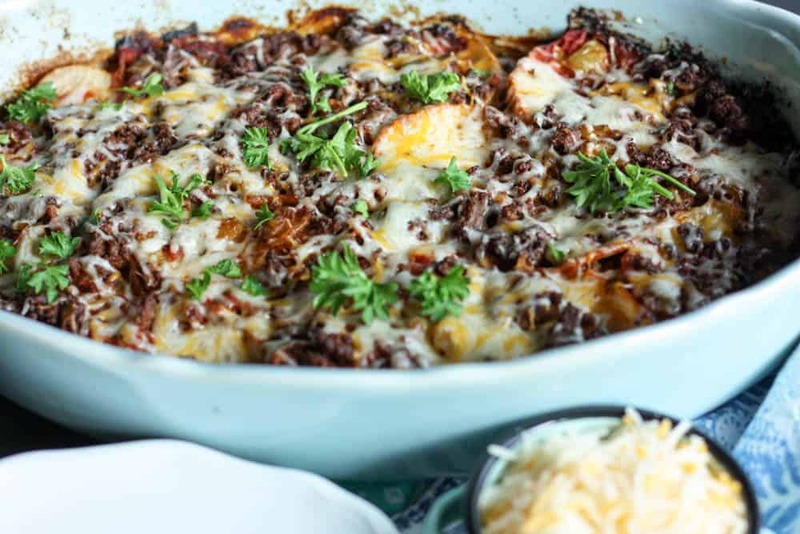 Tex-Mex Lasagna, that is. Southwestern flair adds interest to any meal and you’ll be happy to know there’s plenty layered in this masterpiece. I’m going to let you in on a little secret; this dish couldn’t be easier. 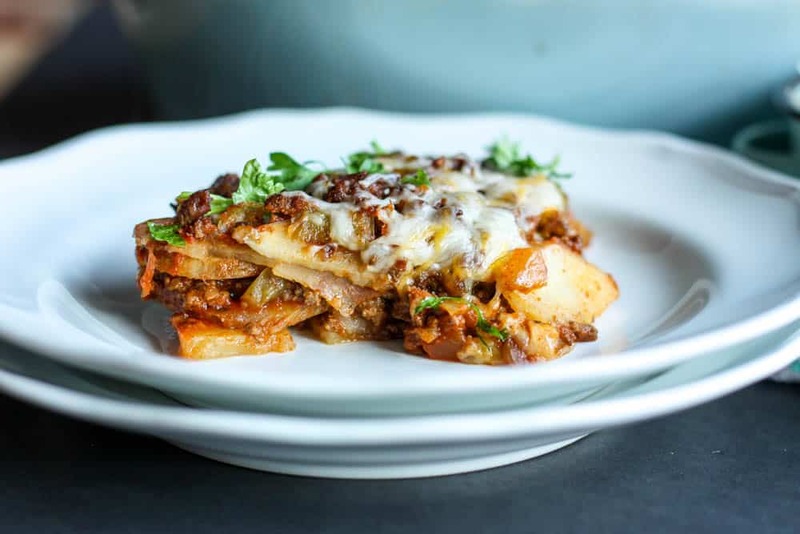 Oh, and we’re replacing traditional lasagna noodles with potatoes so this is completely gluten and grain free! 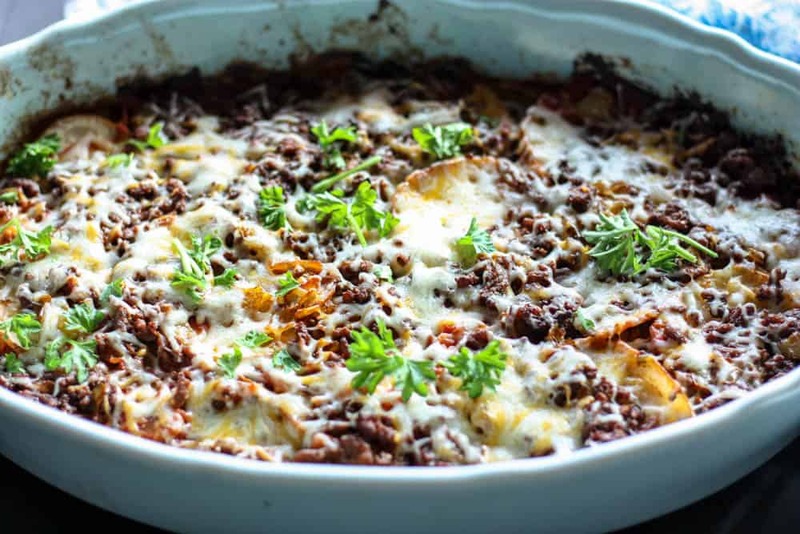 All you’re going to do is brown meat with some classic taco spices, layer it between slices of potato and your favorite salsa, bake, and top with a light sprinkling of cheese. That’s. It. Reward yourself with one of my Avocado Brownies for a job well done. 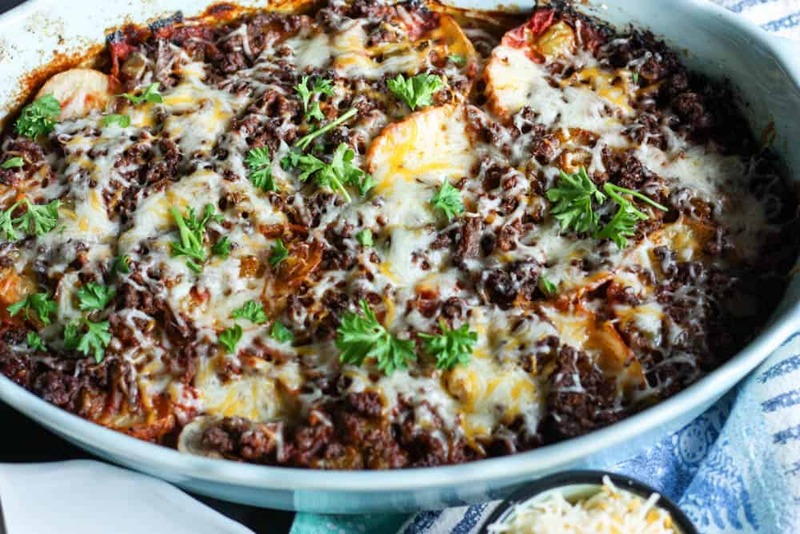 This delicious and healthy Tex-Mex Lasagna is the perfect dinner recipe for busy weeknights. Your family will love the Southwestern flavors! Heat a large frying pan over medium-high heat with olive oil. Dice the onions and peppers and add them to the hot pan. Cook the onions and peppers for 3-5 minutes, or until they soften and the onions turn translucent. Add the meat and spices to the pan. Cook for an additional 5-8 minutes until meat is cooked through. Meanwhile, scrub, dry and slice the potatoes into thin rounds. They should be about 1/16-1/8 inch thick. Lay 1 layer of them down in a casserole dish, mine is roughly a 10x13 inch oval dish. When the meat and veggie mixture is cooked, layer 1/3 of the mix into the dish and cover the potatoes. Cover with 1/3 of the jar of salsa. Repeat this process twice more and place the "lasagna" into the oven for 45 minutes. 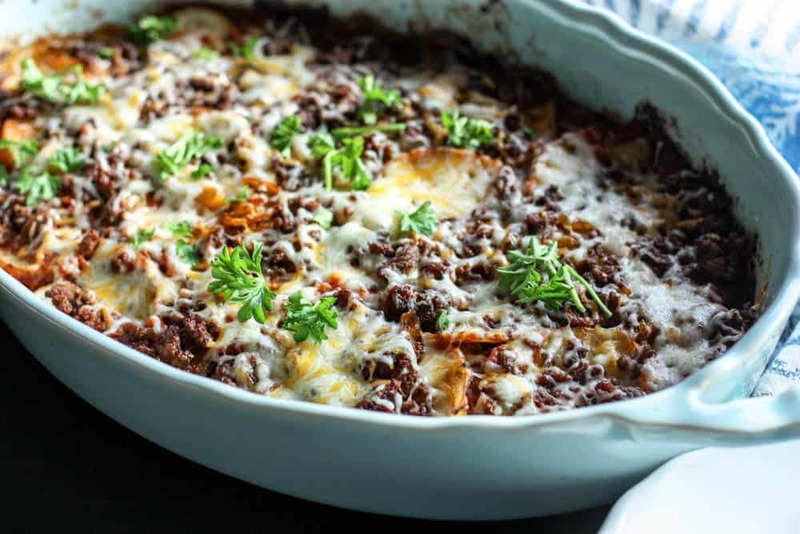 Remove, sprinkle with the cheese, and place back into the oven for an additional 10 minutes, or until the cheese is melted and the potatoes are soft. Let cool, slice and dig in! HI Jenny! 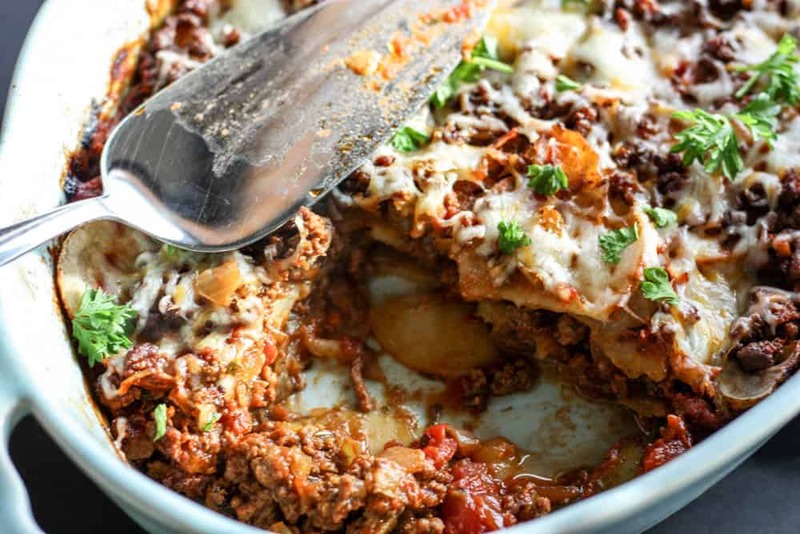 We love a good Lasagna and your Tex-Mex looks delicious! Love all the flavors, bet it tastes amazing! Can’t wait to try it- next on our list of recipes!! I’ve never been the biggest fan of lasagna, but I love tex-mex. I reckon this could be a winner in our household!